access to our complete program including K5 Reading, K5 Math and K5 Spelling. Sign up for your free trial today! No credit card required. Not that the flash video technology used by our lessons is not supported by most mobile devices; if you would like to sign up for our free trial or login to your account, please visit us using a desktop or laptop computer or a Chromebook. We offer K5 students free online assessments in eight key reading and math skills. This data is used to personalize your child’s learning program according to your child’s needs. An animated character will guide your child through the online assessment. There is nothing to download or install. Your child will be asked a series of questions in different skill areas. An in-depth review of the assessment technology used by K5 can be downloaded here. Your child’s free reading and math assessment reports will be available immediately (sample report). The reports provide an objective evaluation of your child’s reading and math skills. Strong in phonics? Then your child will begin with higher level phonics lessons. 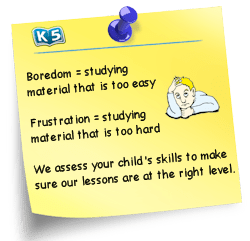 K5 customizes its lessons for each reading and math skill evaluated during the assessment, which means your child receives a personalized online learning program – at a fraction of the price for a tutor. Phonemic Awareness – identifying and working with individual sounds in spoken words. Phonics – understanding the relationships between written letters and spoken sounds. Sight Words – recognizing high frequency words to increase reading fluency. Vocabulary - understanding words and constructing meaning from their context. Reading Comprehension – understanding of fiction and non-fiction reading materials. Numbers and Operations – simple counting through fractions and beyond. Measurement Concepts – including telling time and counting money. Geometry – understanding characteristics and properties of geometric shapes.